We briefly had some spring weather in the Bay Area recently, but now we’re getting some spring showers. Still, you can start building your list of great places to eat outdoors, and I would put Starbelly in San Francisco’s Castro neighborhood near the top of your list. 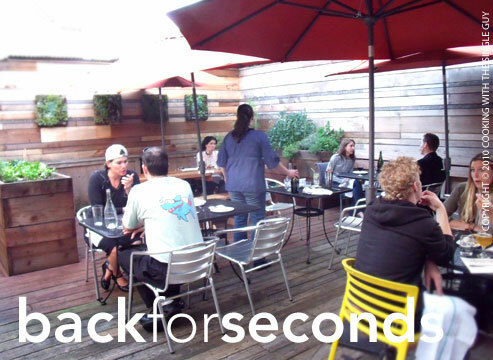 When I first visited this new neighborhood joint, I was seated in a tiny two-top in the front area by the bar. This time I returned with my friend Ken (who also ate with me the first time) and we requested the garden since it was such a beautiful day. Walking to the back, Ken and I got a mini tour of the rest of the restaurant, which we didn’t get to see when we sat in the front. It really looks spacious and fun in the back. 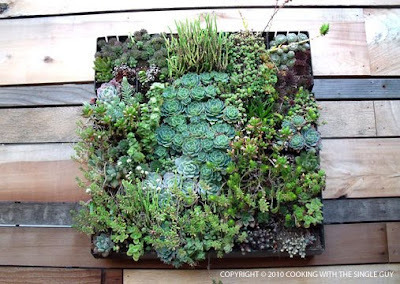 The garden looks bright and cheery, with some potted plants and interesting vertical garden displays. The wooden planks guarded us from the outside noise, but didn’t enclose us into a humid greenhouse like I’ve experienced at other restaurants. Ken and I were there for a few small plates since we were headed to another event. We started with some drinks. 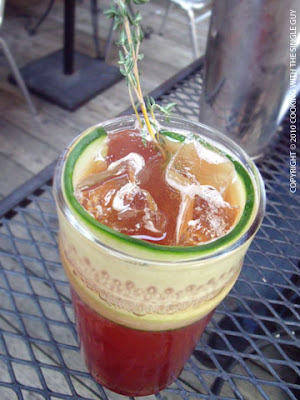 Inspired by the almost-summer weather, I got the Housemade Pimm’s Cup ($8), which my friend Sylvia introduced me to as a perfect summer drink. Made with a gin base and ginger soda, Starbelly’s version came with a slice of cucumber wrapped around the inside edge of the glass. Ken ordered the Calimocho, which was his first time trying this drink that our server told us is very common in Paris (but Wikipedia says is originally from Spain). 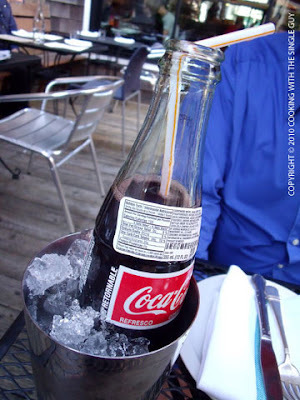 It’s a blend of red wine and cola, so it was festively presented at Starbelly in a Coca-Cola bottle in an ice bucket. Ken says he enjoyed it and felt very French. For our food, Ken ordered the asparagus soup ($9), which was perfect for the spring, and included seasonal crab. 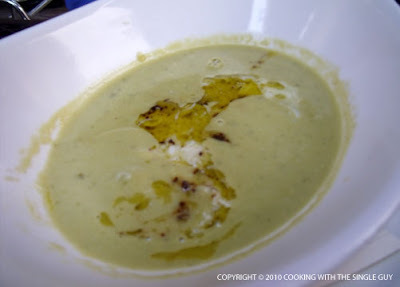 He also ordered the Market Apple and Celery Root Salad ($8), which oddly had some green-colored dressing that looked like his asparagus soup. 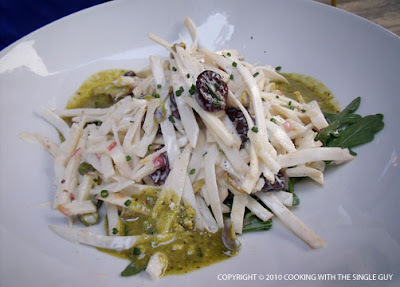 The celery root was sliced into strips that looked almost like pasta and garnished with dried cherries and pistachios. I ordered the Little Gems Salad ($9), which I enjoyed the last time because of the hazelnuts. 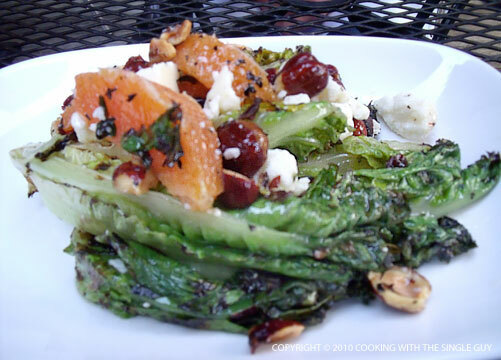 This time it got changed up by being a warm salad, with the little gems slightly wilted on the grill, and freshened up with oranges and goat's milk feta. 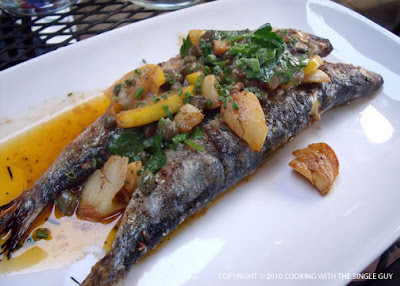 I also got the Grilled Local Sardines ($9), which was plump and tender served along with tangy roasted lemons, pimenton and capers. This tasted like a classic Mediterranean dish. 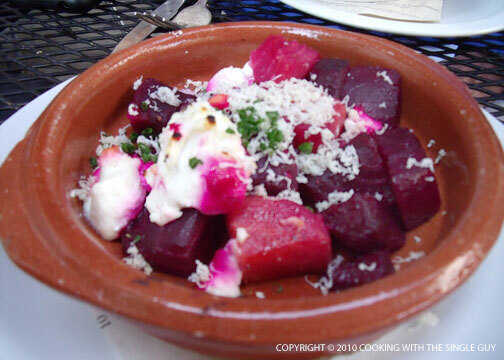 For a small side, I got the oven-roasted beets ($6), which had sprinklings of a soft and creamy chevre cheese that got partly tainted from the red beets to create a pretty pink blush. It was a lot more fun dining in the garden, where the tables aren’t as packed as in the main dining area or squeezed bar area. With Starbelly’s refreshing drinks and seasonal small bites, this is a great place to hang out and enjoy the sun. Update experience (previously 3.25 stars): Holding steady with its fresh ingredients and contemporary/casual ambiance. I knew putting together the poll for this month’s Test Kitchen (where I test the recipes from the pages of Food and Wine magazine) that the pork tonkatsu recipe would win (40%). I mean, fried breaded pork cutlets? I knew you guys would force me to make something fried. Well, I put it out there as an option because this was supposedly a healthy version of pork tonkatsu. 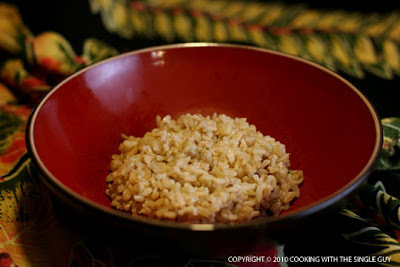 I was also interested in this recipe because it reminds me a lot of growing up in Hawaii. Pork tonkatsu is one of the popular plate lunch entrées (others are teriyaki beef and kalua pig). I’ve eaten pork tonkatsu before, and enjoyed it, but I limited it when I was growing up because I knew it was deep-fried. And when I left Hawaii, I ate pork tonkatsu (offered at many Japanese restaurants) as often as I ate fried chicken. 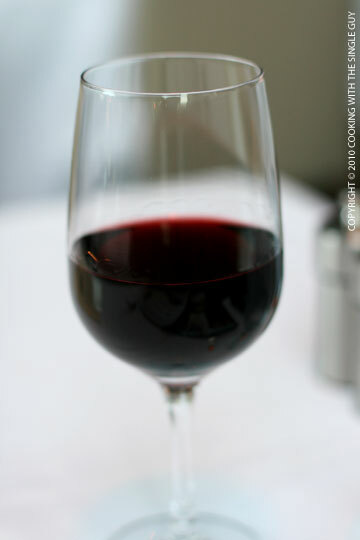 You can get the full recipe from the Food and Wine Web site here. And here’s how it went in my kitchen. 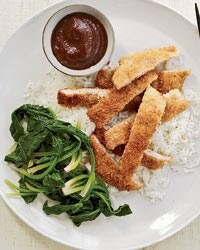 First off, you make the sauce that goes with pork tonkatsu. I have to say, even though I don’t eat a lot of pork tonkatsu, I loooove the sauce that comes with the dish. It’s like a cross between ketchup and A1 steak sauce. I like it so much that I even have a bottle of the stuff in my frig that I got from a Japanese grocery store. I use it when I make pork chops. 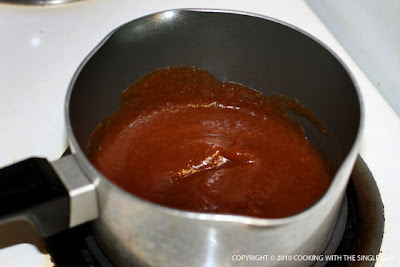 But since I’m testing the recipe, I started out putting all the ingredients in a small saucepan: ketchup (told you), apple butter (my first time using this stuff), Worcestershire sauce, soy sauce, Dijon mustard, and rice vinegar. You just warm it up and blend everything together. The recipe didn’t say for how long, but since none of the ingredients are raw, I just cooked it long enough so everything could blend together. This is how it looked – a bit lighter than the sauce I typically see. The pork needed to be pounded into 1/2-inch thickness. 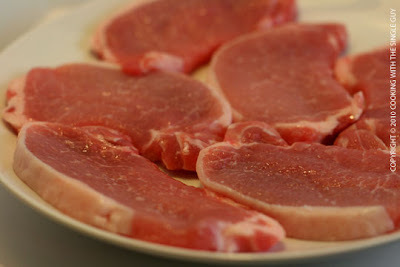 But I was too lazy for that, so I just bought the thin-sliced boneless pork pieces at my local Safeway. 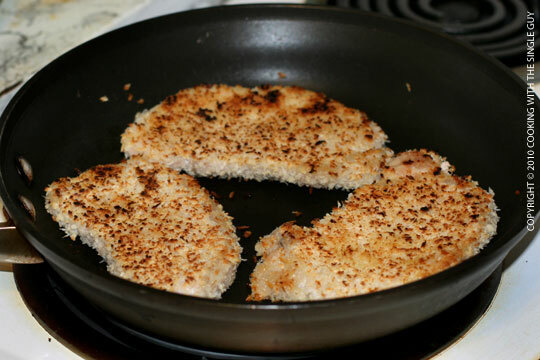 Then the pork cutlets are pan-fried with a bit of oil in a pan. The dredging technique is pretty basic: start with dipping in flour, then egg whites, and finally the Japanese bread crumbs known as panko (which isn’t actually made from bread but works the same way). Unfortunately, I followed the instructions for browning and for some reason the panko didn’t seem to brown evenly, probably because it was not immersed in hot oil. So the pork tonkatsu looked a bit sickly in a weird white-and-brown spotted way. 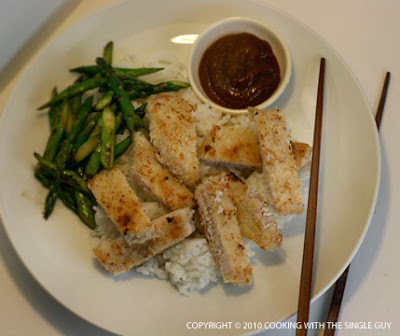 When I was doing frying up my pork tonkatsu, I served it up with some steamed rice and sautéed asparagus since that’s in season (the recipe says spinach but I’m sure you can use any greens). So here’s how it turned out. Yep, it doesn’t look like how I remembered pork tonkatsu in Hawaii. I think 1/4-inch thickness is better than 1/2-inch. The thinner the pork, the quicker it’ll cook and less time sitting in oil. Even though I don’t like submerging food in oil, if you want golden brown, you’re going to have to use more than the amount I used, which was about two tablespoons but now I see the recipe called for 1/4 cup canola oil. Not sure if that will make a difference. Use less apple butter to avoid your tonkatsu sauce tasting like apple sauce. Ease of cooking: This is super easy because you just mix together the sauce and for the pork it’s just dredging and frying. It’s really simple, but a bit messy, which is another reason why I don’t fry foods that often having to create that dredging station of three plates which each dipping ingredient. Taste: The pork with its pale panko crust was tasteless. This even after I seasoned the pork with some salt. I guess the taste is supposed to be helped by the sauce, but my sauce tasted mostly like apple sauce and wasn’t as silky and thick like the store-bought version I had already (and ended up using to finish off my pork). Don’t forget to vote in the poll on the upper right-hand column to let me know which recipe I should test from the pages of the April edition of Food and Wine. Some of you know my rule about ordering duck — if it’s on the menu, I’m ordering it! I love duck, so I never miss the opportunity to eat it when I dine out. And since it seems like a messy dish to make at home (I imagine lots of duck fat splattering and me running with my fire extinguisher to put out duck fat-induced flames in my oven), I rather leave the cooking of duck to the experts. So imagine, for me, what it’s like to have a night where every course is duck. Quack heaven, baby. 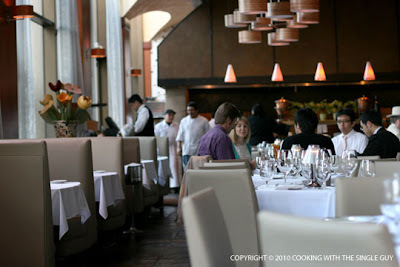 My duck dinner took place last Friday at One Market Restaurant in San Francisco. This Embarcadero restaurant and its chef, Mark Dommen, actually dedicate a five-course prix fixe menu to one animal every Friday and Saturday night. It’s called the “Weekly Beast” dinner. Sometimes it’s suckling pig or rabbit. Other more predictable like lamb or goat. The schedule is released a couple of weeks before, and I checked regularly to see when they would get around to doing duck. 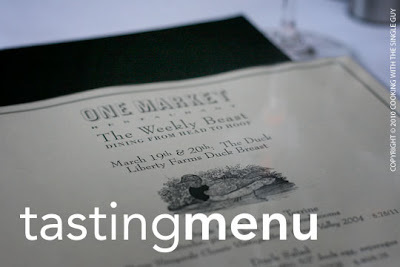 Once the duck dates came out, I booked a reservation and arrived for my dinner featuring duck from Liberty Farms. I’ve actually never dined at One Market, thinking that since it’s near the Embarcadero that it was partly a tourist trap. Yes, there were quite a few tourists sitting around me, but it’s actually a very charming restaurant with an active bar. 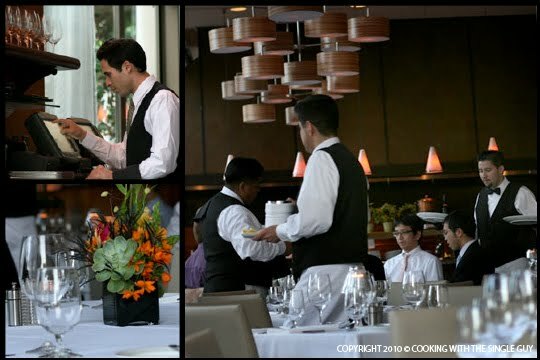 This one Michelin-star eatery also offers a chef’s table, which always intrigued me but I never had a party big enough to reserve the whole table. The Weekly Beast dinner cost $49, which is a nice bargain for five courses. 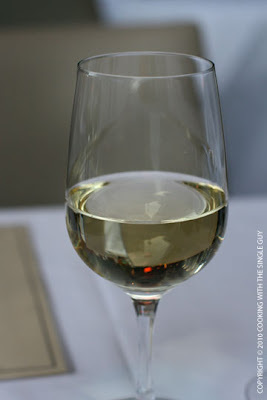 I also decided to do the $20 wine pairing, which is quite a value because as you’ll see in the upcoming photos, my server poured me a nice-sized glass for each course. 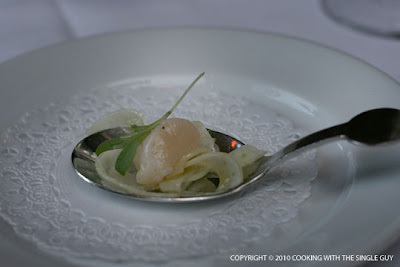 My dinner started, ironically, with a bay scallop amuse from the chef. I expected it to be some kind of duck, but I guess this was the same amuse offered to other guests who were ordering off the regular menu. Still, it was quite refreshing with the pickled fennel shavings. But now to the duck. First off was a duck liver mousse terrine, which was served with pickled hon shemiji mushrooms and a streak of reduced balsamic vinegar. A tray of sliced brioche was brought to my table to allow me to slather on the duck mousse. The mousse had a rich, gamey taste, and the thick balsamic acted like the Chinese hoi sin sauce — a popular condiment for duck. 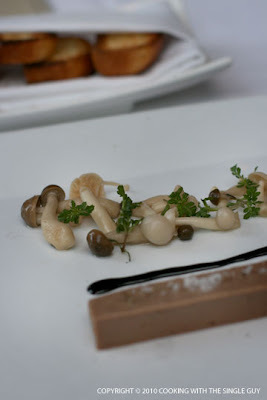 The pickled mushrooms helped to cut the rich flavors. 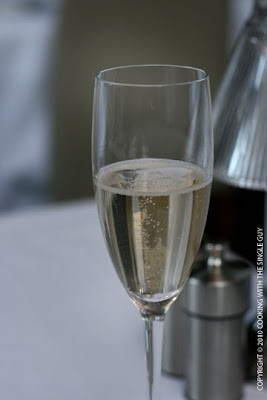 The mousse was paired with an effervescent 2004 Iron House Vineyards Classic Vintage Brut from Green Valley. Second course was a duck salad where the duck egg in the center was cooked to exactly 62 degrees. 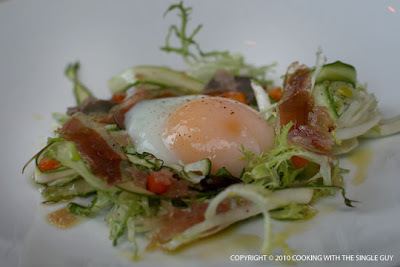 It topped a salad of frisee, seasonal asparagus thinly sliced, and home-made duck prosciutto. There were also bits of preserved duck that was tender and dark, contrasting with what was overall a light and refreshing spring salad. The salad was paired with a 2008 O’Reilly Pinot Gris from Oregon (I love some of the wine coming from Oregon these days, especially this light-but-substantive pinot gris). 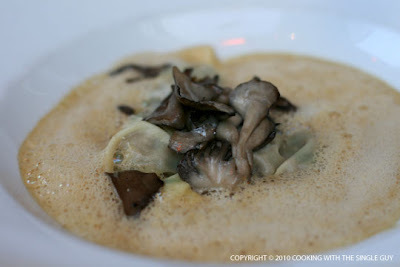 The third course was duck leg ravioli served with mustard greens, hen of the woods mushrooms, and nearly engulfed by a foie gras emulsion. I have to say, the foie gras emulsion had a very beautiful pastel color, and it actually added a nice savory taste to the ravioli underneath. There were about three pieces that were filled with minced duck leg. I found this course very enjoyable. 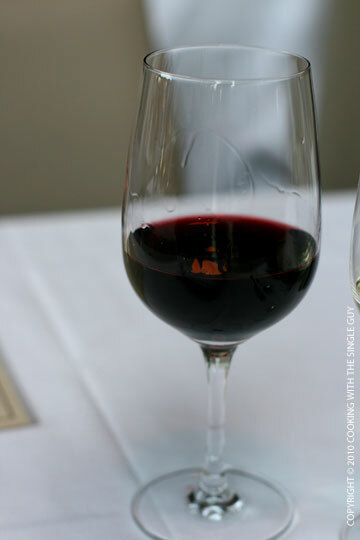 The pasta was served with a 2006 Old Press Syrah from Paso Robles. The main course (No. 4) was roasted duck breast, ‘natch. It was served with blood orange segments, ginger and endive. But pay close attention to the caramel-colored pieces on top. I don’t know what they were but they were genius. Thin candy-like pieces that resembled the crackling of duck skin, but definitely not skin. 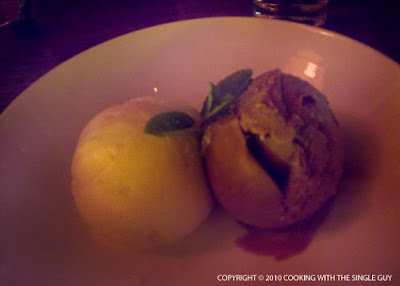 It added a surprise element to the dish with contrasting textures. The duck breast was perfectly cooked and the sauce had a familiar deep flavor that complimented the meat. 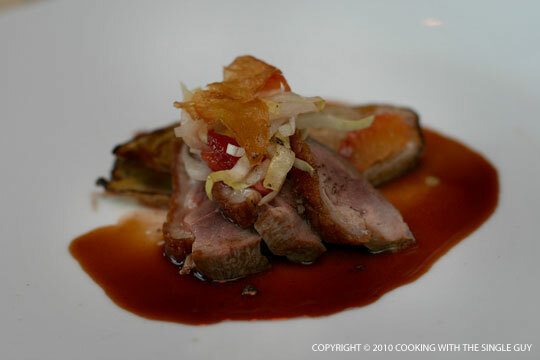 The duck breast was served with a 2007 Morgan Twelve Clones Pinot Noir from Santa Lucia Highlands. This was the heaviest wine of the night, which made sense. I had thought a five-course duck dinner would weigh me down (but I was all game for it because of my love for duck). But Chef Dommen created such an interesting and diverse menu that it kept me engaged without playing the same taste note throughout. I thoroughly enjoyed my ducky dinner, and find One Market’s Weekly Beast dinners to be very intriguing. If you haven’t tried it yet, I highly recommend you check out the restaurant’s Web site to see the upcoming schedule. If you see a beast you love, do go and enjoy the feast. One Market, 1 Market St., San Francisco. PH: 415.777.5577. www.onemarket.com, “Weekly Beast” every Friday and Saturday. I’m tapping into my island roots for this latest recipe. 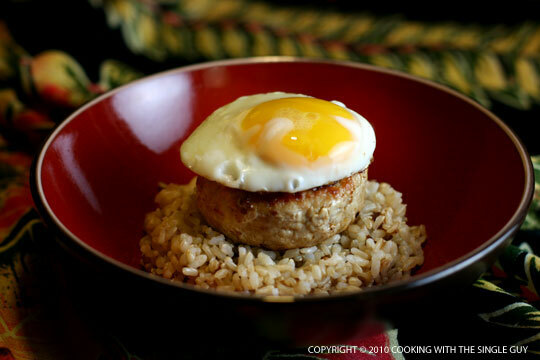 Full disclosure: I’ve never eaten a “loco moco,” which is the Hawaiian creation of a bowl of rice, a hamburger patty, a fried egg, all topped off with a heaping pour of brown gravy. This iconic Hawaii lunch dish is so Hawaii in many ways: 1) it’s a mixture of cultures with the Asian influence of steamed rice and the Western influence of hamburger, and 2) it involves thick brown gravy, which for some reason people in Hawaii love to lather their food in some kind of sauce. So here’s how it turned out. Because to make a loco moco is really an assembling of parts, this recipe is explained in steps. This is pretty easy. You just throw some rice into your rice cooker and then scoop it into a bowl. If you don’t have a rice cooker, buy one. It makes life so convenient. But if you really don’t know how to cook rice, you basically put a cup of long grain rice into a pot after you’ve rinsed it a few times, then pour enough water so that there’s a 1/4-inch layer of water on top of the leveled rice. 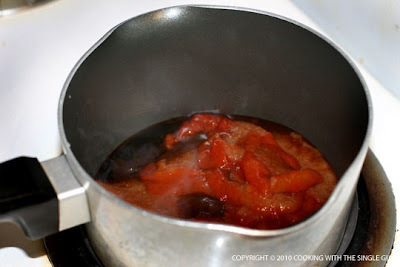 Then bring to boil and reduce to a simmer and cook covered for about 20 minutes until the water has evaporated. Then just fluff it up. (Tip: You might want to leave the pot cover slightly ajar to let some steam out.) 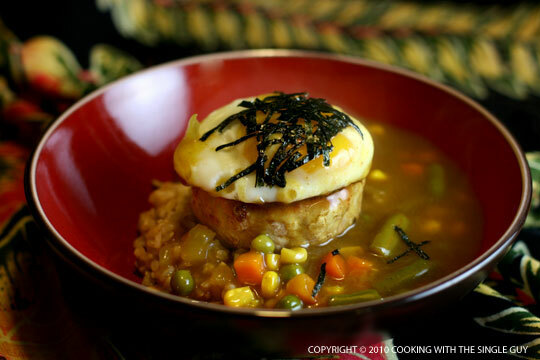 I used brown rice in this case because I find it healthier, but traditionalists would probably argue that you need steamed white rice for a loco moco. Get about 6 ounces of ground meat. You can use any kind but I know the traditionalists will say ground beef. You can do the trick that a lot of cooks do, which is create a blend of ground chuck and sirloin. I actually used ground turkey because, again, I wanted to be healthy. 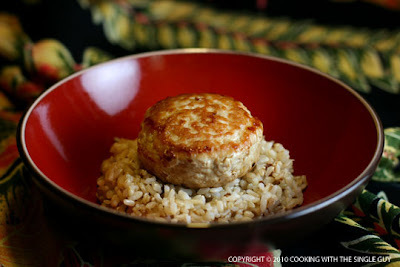 I seasoned my ground meat with a dash of soy sauce (you can add a pinch of salt instead) and simply shaped it into a ball and pressed down until it looked like a hamburger patty. I didn’t add anything else, and really you don’t need to. Then I just seared it in a pan, cooking for about 4-5 minutes on each side until nicely browned. Then you just place it on top of your rice. Now, I’ve seen the fried egg presented in a variety of ways. I’ve seen it fried and sunny-side up, just don’t do scrambled. Fry up one egg however you like and then place it on the top. This is the final step. The traditional loco moco, like I’ve said, would pour brown gravy over everything. But I decided to make a simple curry. I consider myself an adventurous eater, although I generally steer clear of (altogether now!) deep-fried food. I also have favorite cuisines (like Vietnamese and Italian), which means I also have some not-so-favorite (like Mexican and Indian). But still, I try to be open-minded and will test myself now and then. Such was the case recently when I found myself at Dosa, one of the city’s more popular Indian restaurants. The restaurant specializes in South Indian cuisine and first opened in the Mission District on Valencia Street. 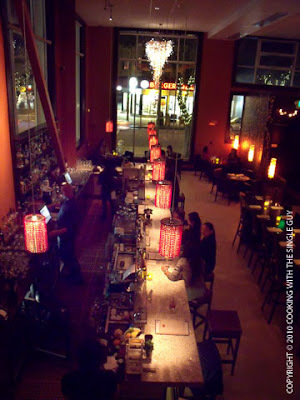 It became so popular that they opened a larger and more stylish second location across from the Sundance Kabuki Cinemas on Fillmore. I went to this location with my friend Janet, who was visiting from out of town. I had given her a few options near her Van Ness Avenue hotel, and by the time we walked through Japantown catching up with each other, we ended up just walking into Dosa. 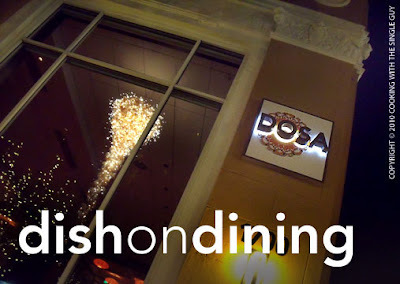 Dosa’s second location has an expansive dining area and a pretty glitzy bar. Even though we didn’t have reservations, the hostess accommodated us at a table in the alcove area overlooking the bar. This tiny spot looked almost like a second bar area with a counter and a few two-top tables. Since I don’t usually eat Indian food (not a fan of the multiple spices and the overcooking of meats), I felt overwhelmed by Dosa’s menu. 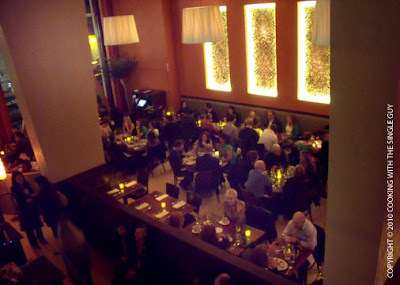 Plus, it didn’t help that the lighting in the restaurant was San Francisco lounge-dark. So Janet relied on our waiter for some recommendations, but unfortunately she also revealed to him that I don’t like deep-fried foods. This resulted in our waiter giving me the eye (like he was thinking, “um, so why did you come here?”) and responding, “most Indian foods are deep fried.” I kind of found that hard to believe, and I also didn’t like his dismissive tone. Anywho, we were able to order a few dishes with our waiter’s help. We started out with a dosa since it must be a house specialty given the restaurant gets its name from this South Indian dish. Dosas are crepe-like dishes often filled with creamy potatoes. The menu lists several varieties, but we went with the Roasted Chile and Garlic Masala Dosa ($11.50). The dosa came out looking like a brown triangular pita pocket accompanied with three types of dipping sauces. It was filled with a potato puree with onions and spicy chutney. We just had to tear into the dosa and ripped ourselves a piece to eat. It was all kind of difficult to maneuver but I loved the thin crepe exterior and the creamy filling. Janet liked the variety of dipping sauces although one was very spicy. 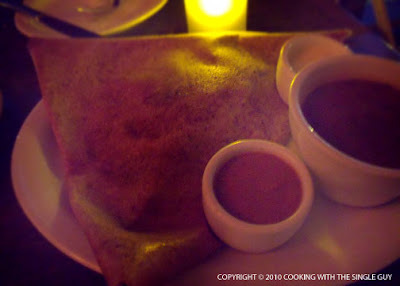 Still, the dosa was my favorite thing of the evening. Then we had the Spicy Sweet Scallops ($10) as a starter. The scallops came out with a beautiful sear, sitting on two types of sweet and spicy sauce. 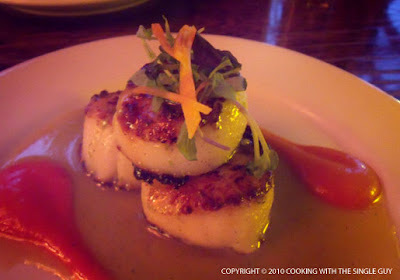 I thought the scallops were cooked really well and the tangy spicy sauce was enjoyable. 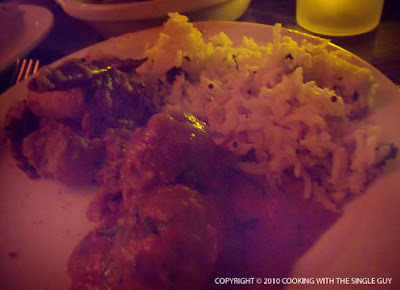 We shared a couple of entrées, including the South Indian Lamb Kofta (lamb meatballs) with lemon rice ($19.50) and the Spicy Andhra Prawns ($18) with coconut rice. I know it seems like we ordered a lot of dishes with the word “spicy,” but not all of them were spicy hot. Again, we had awful lighting at Dosa so I feel like my photos do more harm than good so I can’t show you nice shots of our entrees. Instead, here’s my plate with everything I ate. I really enjoyed the lamb meatballs, which had a tomato and spinach sauce. The meat was tender and the sauce tasted very Italian. The prawns were OK. They were cooked well but both Janet and I agreed that the sauce was a bit clumpy and dry, almost like a paste, so it was an odd texture to eat with the prawns. We both liked the infused rice that accompanied our dishes. Because the dishes weren’t very large, we still had room for dessert so I ordered the Passion fruit Pudding ($8) while Janet ordered the gelato ($6). I didn’t bother taking a photo of the pudding because it just looked like white jook or congee (the Chinese rice porridge). It had the same texture as jook, but it was sweet with bits of passion fruit. It was nice but it was topped with a stale cookie stick. Janet’s gelato was cardamom (my favorite) and some kind of chocolate flavor that I forget now. It was also good, but nothing surprising for gelato. I found Dosa’s club vibe and expansive room to be sophisticated and hip, making it seem like a fun place to return and get a drink at the bar and munch on a dosa. In the end, I think I enjoyed trying the flavors of South Indian although it didn’t necessarily turn me into a lover of Indian food. 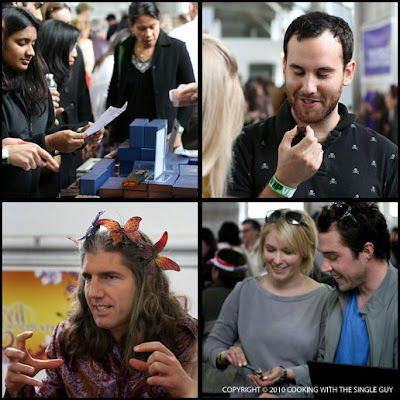 I am still feeling the effects of yesterday's Fourth Annual San Francisco International Chocolate Salon at Fort Mason. I still have no appetite after eating all those sweets! Still, it was all worth it. 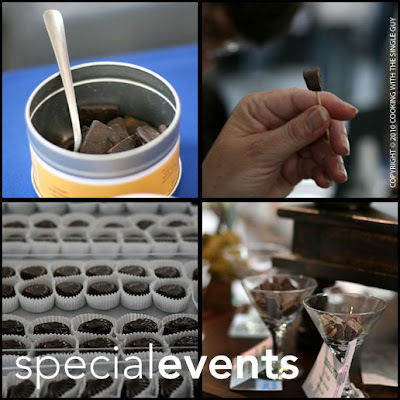 I've been to all but one of the chocolate salons -- an all-out gorging of chocolates. 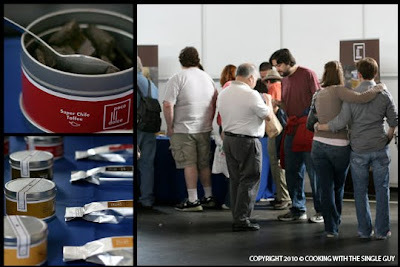 This is the second year the event was held at the Festival Pavilion, a much larger and spacious location. And wow, did it make a difference. I remember the years of being squeezed into that tiny room near the front of Fort Mason and how it was like a rugby scrum to get a tasting of the chocolates. One of the first booths I stopped by (and one that constantly had a line) was San Francisco-based Poco Dolce. They consistently produce some of the best chocolate squares with caramel. Their latest flavor is a chili (which seemed to be a popular flavor at a few chocolate booths) that wasn't spicy when you first eat it but has a nice heat at the end that stays with you for a bit. 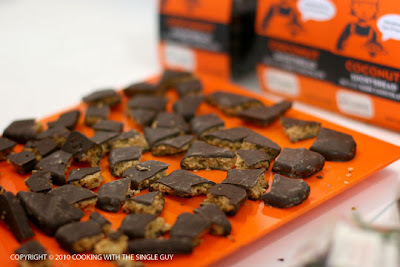 This chocolate maker had all sorts of chocolate-covered cookies, like these chocolate covered coconut shortbread cookies. 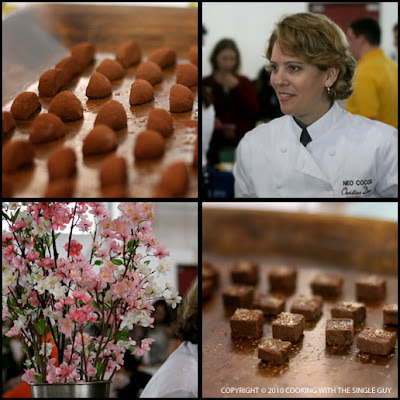 Some of the really beautiful chocolates (and an appropriate spring display) was Neo Cocoa, another San Francisco chocolatier founded by Christine Doerr. 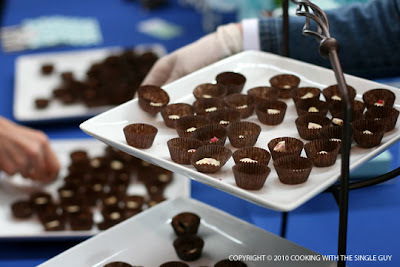 There were so many tables of chocolate makers that it was hard to go table to table. After awhile, I just zoomed from one to another like a bee, being attracted by the ones with the nice display or interesting-looking chocolates. 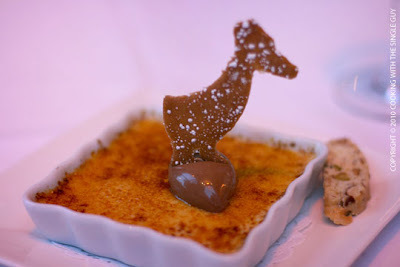 These are from Robyn Wood, a former pastry chef who now lives in Monterey. I really liked her packaging. Eating all the sweets, it helps visiting the liquor and drinks tables just to cut some of the sweetness from the thick chocolates. 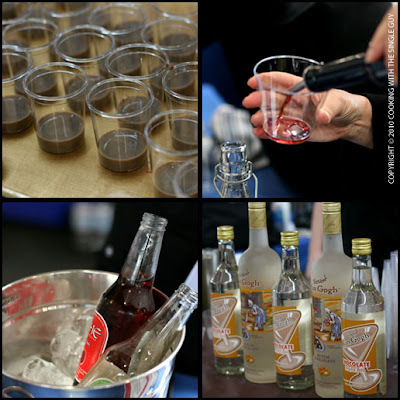 There were chocolate liqueur, ports, vodka, and sparkling drinks. 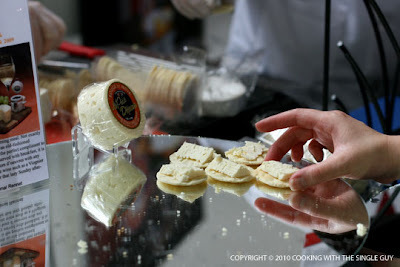 Also for some change of pace, this one booth was passing out this creamy brie cheese from France. This is Jamie Kasselman, who launched her new marshmallow line at the chocolate salon. 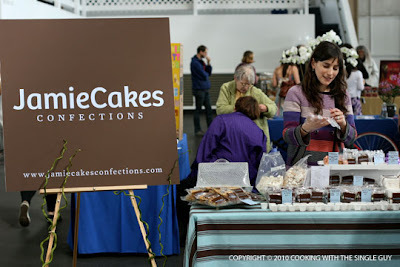 Earlier this year, I predicted that homemade gourmet marshmallows will be the new food trend for the decade, and Kasselman is helping me out starting her Jamie Cakes Confections. Kasselman says she made marshmallows all the time for her family and friends, and now has created this new line. Her favorite flavor is rocky road marshmallows. 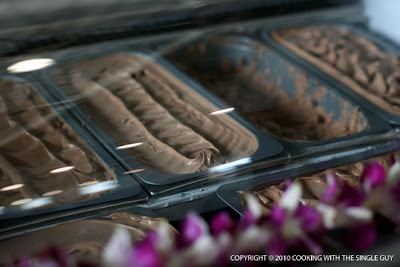 Kasselman is also owner of The Sweet Dish candy store on Chestnut Street in the Marina. 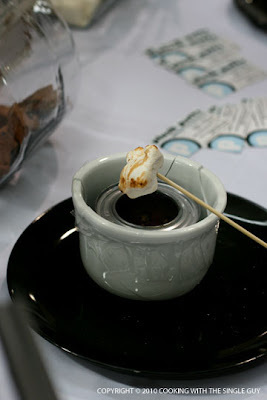 Another marshmallow vendor (told you it was a trend!) was Plush Puffs, who were letting people toast their marshmallows for that campground flavor. 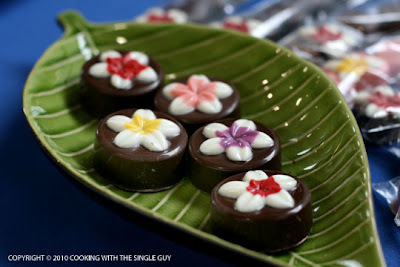 There weren't that many unusual chocolates this year, I felt, but one of the more interesting ones were these chocolate-covered Oreo cookies made by a Hawaii-born entrepreneur who started Plumeria Flours. Here's a chocolate sausage, which the chocolate maker told me is a common thing in Italy. I've never seen them, but supposedly when you slice them, the marbling makes it look like salumi. 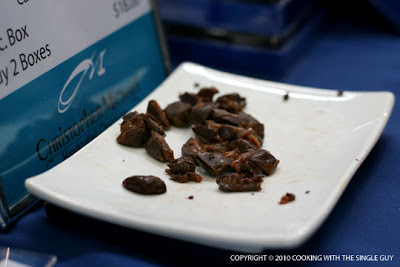 This version made by Cacao Chocolates of Atlanta. 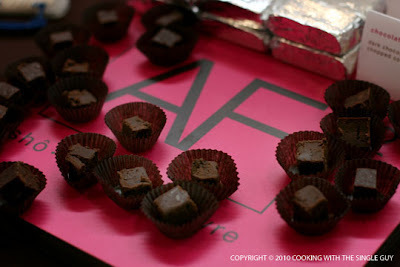 There were also brownies (tried some amazing lavender-flavored ones) and fudge, like these by AF-squared, or Auntie Fruf's "aahsome fudge." I mentioned some lavender brownies that were great, and lavender was popular in other things, like this lavender-flavored gelato from Maui. It tasted sooo good but unfortunately isn't sold outside of the islands, so you have to fly to Maui to taste it. I'd hop on the next plane for this. There was a big crowd in front of this booth by WD (William Dean) Chocolates of Florida. 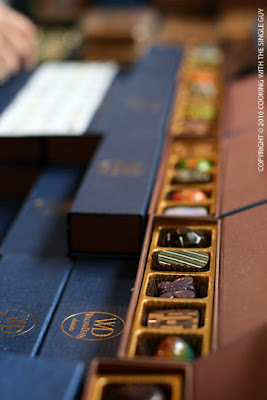 Their chocolates were like jewelry because they were so colorful and nicely hand-painted. It may have just been too pretty to eat. 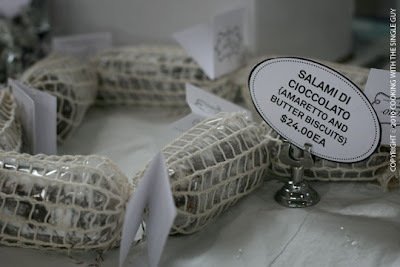 Of course, someone had to bring chocolate covered bacon. 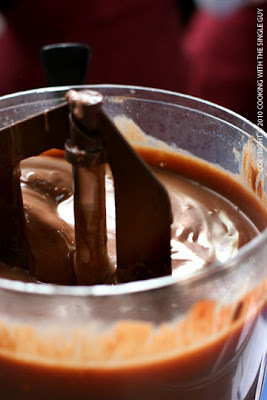 Here's some melting chocolate at the Schoggi Chocolate booth. I know, you're tempted to bathe in it too, huh? I remember seeing this chocolate maker two years ago when she just sold three Asian-influenced bars and it's nice to see her now expanded and growing with some amazing products. 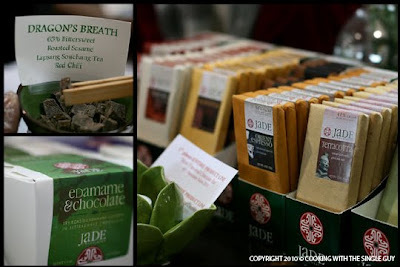 Mindy Fong of Jade Chocolates uses her background to create unusual treats, including chocolate-covered edamame. I spent nearly four hours wandering the pavilion shooting pictures. Everyone seemed to have a smile. 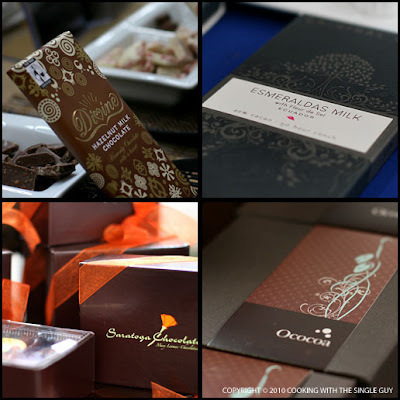 It was a beautiful first day of spring filled with sunshine (outside) and luxurious chocolates (inside).